Title: BNSF 7869 with BNSF 7871 Leading her roll west at daybreak as they pull a westbound Z towards LA, Ca. Description: BNSF Train M MCNKCK1 26 sits crewless at Armour on the BNSF St. Joseph. Title: Stack Rippin' By Peck Park @ 30 m.p.h. Description: BNSF 7869 leads this east bound stack train past Peck Park. Title: BNSF 7869 Rips a 5 unit stack train EB. Description: EB stacks fly past Peck park in Galesburg IL on the transcon route. 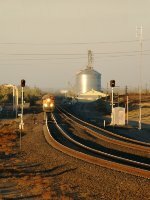 Description: A long BNSF train approaches the wye to head towards the Stockton Yard. Description: On my first railfan trip and the first freight I get a nice BNSF train with a WarBonnet and a Norfolk Southern unit, plus two helpers to boot. Great way to start a trip. Description: BNSF 7869 and CEFX 6017 idle away in the Pacific / Dozier Siding on the lead of this freight on BNSF Cuba Sub. Description: BNSF 7869 is DPU on an eastbound intermodal train at Rochelle, IL. Description: CSX K140 crawls past the station at walking speed with BNSF ES44DCs 7869 and 7328 on the point. Description: BNSF 7869 leads this empty oil train north on the BNSF Hannibal Sub. as it rolls into Elsberry, Mo. just south of town. Description: At Ellinor, a 4 pack of GE's lead an all spine car intermodal west, an increasingly rare thing to see. Description: The pair of ES44 units head up a westbound container train just entering the massive BNSF Argentine Yard. Description: BNSF 4948 - BNSF 7869 - BNSF 6341 - BNSF 2307 - BNSF 2925 (not the prettiest of pictures) in an odd situation or optical illusion which looks like one of our little local pair of yard engines twins are lashed between a trio of roaders and a line of mixed freight. Description: BNSF 7869 as the last of the power triple-header on the turn-table spur in the shadows of the 39th St auto bridge / yard over-pass (believe it or not, until a dozen years ago plus a few, it was all at-grade crossing through there).